"...the Achnasheen part of the build (“Network 1” in the slide) we will soon be able to confirm when we expect to start commissioning the network and therefore require all of the “dig-your-own” work to be completed. 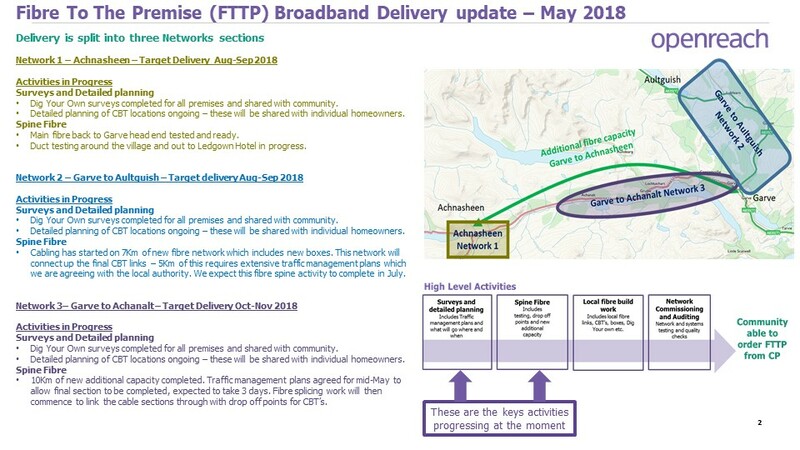 We will of course provide plenty of notice for this but I’d recommend that discussions with the homeowners in the Achnasheen network commence regarding their plans for getting the work completed". BTO will be in touch as soon as they’ve finalised the date. All Achnasheen self dig households will have received details of how this will work, and the grant allocated for each property. In case of query, the contact details for this area are contained within the letters, which everyone should have over the next day or two.